Lisa Jackson began teaching contemporary Pilates in 2003 as an incredible system for conditioning the body. Over her career, Lisa realised Pilates has so much more to offer than a standard exercise class. Pilates has the ability to change a person’s quality of life. It will build higher self-awareness, alleviate stress and nurture the body through breath with controlled and centered movement. Lisa’s desire to understand the body and how it works most optimally led her to seek advice from highly skilled Pilates and allied health practitioners, specialist physiotherapists, musculoskeletal therapists, psychologists, mindfulness teachers and dieticians. She uses this acquired knowledge to implement a movement system that enables people to find true balance and strength. The CORE PILATES BRISBANE concept is centered around Contemporary Pilates as a vehicle to improve movement patterns and mindsets, not only will you feel stronger and fitter but you will discover how to use your body more efficiently. We aim for Pilates to become part of a person’s life, whether they’re an athlete looking to perform at their peak without injury, or a person in their 70’s wanting to be able to keep up with their grandkids. Or you simply want to maintain flexibility and strength to enjoy the fun things in life! “I have this burning desire to help people be the best they can be, to believe in themselves and the power that they hold, we all deserve to be healthy and happy. In a world filled with stress, overwork, and fatigue it’s easy to get lost and give in, but you can make a difference by taking one step towards helping yourself – simply move! To empower somebody else is one of the best gifts we can share. Teaching movement to other teachers, working with clients and challenging my own movement potential is what makes me happy”, Lisa concludes. A Principal Trainer under the Pilates Alliance Australasia and a Faculty Member for PilatesITC, Lisa has established Core Pilates Brisbane as the main training centre for PilatesITC students in Queensland. She is also a Licensed Buff Bones® Instructor, the Buff Bones® Faculty Teacher for Australia and trained to teach with the Oov. In 2015, Lisa was the Brisbane Pilates Trainer for Cirque Du Soleil “Totem” and again in 2016 for “Kooza”. Lisa is currently a committee member of the Pilates Alliance Australasia, working towards building a strong and recognised profession of Pilates Professionals. Lisa has a vibrant personality and infectious passion for Pilates that resonates in all that she does. Her teaching philosophy is client-centric, emphasising correct movement patterning, posture awareness, and general well-being. 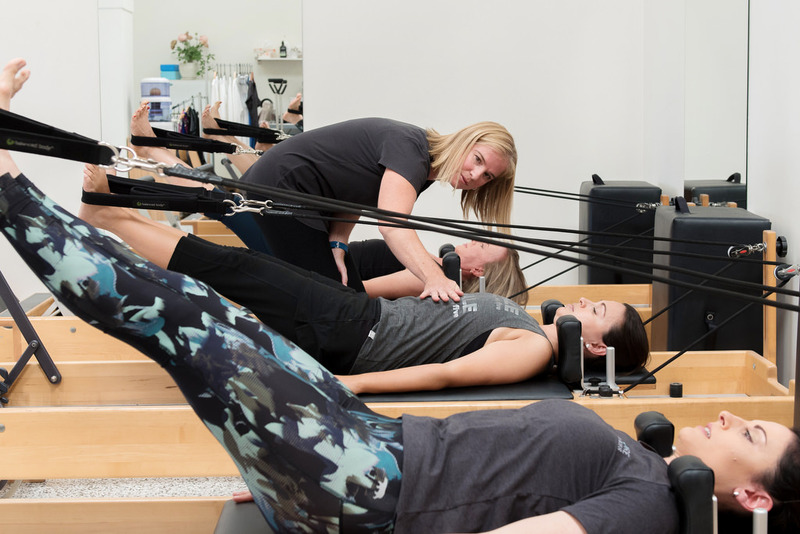 She is dedicated to seeing growth and change for her clients, and believes in nurturing a "stronger connection to yourself"; a concept found in the beauty of Joseph Pilates' work. Lisa began her Pilates journey in 2001 whilst living in Los Angeles. After undergoing major arm surgery, due to a malignant melanoma, she undertook Pilates rehabilitation. Lisa was immediately drawn to the sense of empowerment that Pilates gave her, recognising the physical and mental benefits as something that would become a passion for many years to come. In 2003, Lisa trained at the Physicalmind Institute in Los Angeles and New York. Returning to Australia in 2006, her passion for learning and a desire to further explore Joseph Pilates’ work led her to Sally Anderson, the Founder and Director of Pilates International (PilatesITC). She has since completed her Diploma and Advanced Diploma through PilatesITC and continues to study both nationally and internationally with distinguished Pilates and movement teachers. Julia is a highly-qualified Pilates Instructor and passionate advocate of holistic health. She holds a Diploma of Professional Pilates Instruction from Pilates International Training Centre. She is also a qualified Stott Pilates Instructor, an Xtend Barre Instructor and Instructor Trainer. Julia also holds a Diploma of Remedial Massage and Certificate in Nutrition. With a background in professional dancing, Julia has been travelling the world for nine years working as a dancer and performing artist. Her career highlights include the position of Principal Dancer at Moulin Rouge in Paris, and Principal Dancer / Host for multiple Italian television shows and musical theatre productions. On returning to Australia, Julia began to explore her growing interest in health and wellbeing disciplines, in particular Pilates. Pilates is a long-time favourite amongst dancers as it not only keeps the body in peak form, focusing on core stability, but if (and when) injuries occur on-stage, has incredible rehabilitation benefits. Julia says Pilates is just as beneficial to non-dancers as it is to those who live on stage, "Pilates builds your core strength, focusing on alignment and length. It also gives you greater body awareness so that you learn how to move more efficienctly. That's why dancers love it, but it's also why it's beneficial to everyone - no matter your age or fitness level." Nathália Costa has been working with Core Pilates Brisbane since 2014. She holds qualifications in Polestar Pilates for Rehabilitation and CoreAlign (a method focused on improving posture, balance and functional movement). Nathalia also holds a Bachelor Degree in Physiotherapy with Honours from the Federal University of Rio Grande do Norte in Brazil. Lisia has been teaching Pilates since 2007 and holds a Diploma of Professional Pilates Instruction from the Pilates International Training Center and a Certificate in Matwork Instruction from the Physical Mind Institute New York. In addition she holds Degree Qualifications in Physical Education from the Federal University Rio Grande du Sol in Brazil. Lisia is a perfectionist and this is reflected in her energetic teaching style. She works with her clients to achieve quality movement and build a high level of body awareness. A motivated hands on approach and clear verbal cues ensure you get the very best out of each class with Lisia. Andrea completed her Diploma of Professional Pilates Instruction through the Pilates International Training Centre in 2017. She currently holds a Level One registration with the Pilates Alliance Australasia and is a licensed Buff Bones Instructor. Andrea discovered Pilates 20 years ago whilst working as a Registered Nurse to assist her with injury rehabilitation and prevention. She is passionate about the Pilates method and continues to grow her knowledge base through professional development and she thrives to deliver instructions fostering quality and functional movement patterns. Having been a registered nurse for 25 years, Andrea has a keen interest in health and wellbeing, both physically and mentally. Her caring and fun attitude ensures that each session is delivered with a wholistic approach. Luisa Yallamas is one of our qualified instructors at Core Pilates Studio. Luisa holds a Diploma in Professional Pilates Instruction (PITC) and is a qualified Buff Bones Instructor. She also holds Certificates 3 & 4 in Fitness having worked as a Personal Fitness Trainer, Luisa understands the body and the way it functions extremely well. Luisa is well equipped to assist people in making a positive change in their lives, with her experience in the fitness industry, she has the skills and knowledge to help people achieve their goals. After discovering the many and varied benefits of Pilates through needing a natural therapy for neck and back pain, Luisa has since gone on to become a fully qualified instructor so she can empower other people to move and strengthen their own bodies. She believes when you learn about your posture and the way you move, it brings about awareness and discovery. Luisa feels Pilates is for “every body” – age or ability is no barrier. Luisa is a breast cancer survivor, having had 2 diagnosis over 10 years and ongoing treatment. She has an incredible inner strength, self-belief and determination, that has seen her recover and come out stronger. Luisa wants to be a motivator and role model for her clients, whether they are facing health issues, challenges or have a particular goal in mind they want to achieve, she can show you what it takes to be successful. She is living proof that anything is possible! Jehane is fully certified STOTT PILATES Instructor with a background in Dance, BA (Hons) WAAPA. She completed her Pilates education in Sweden at Stockholm Pilates Center and has been teaching a variety of different techniques, including Barre and Garuda Apparatus, since 2011. Jehane's interest in Pilates developed from a need to complement her dance training with strength work. She found it so effective in its methodical yet holistic approach, that she decided to pursue it professionally. With a keen eye for movement and a love of the work, Jehane is invested in the needs of her clients. She thoroughly enjoys helping them connect to their bodies to improve strength, mobility and motor control, so they can achieve their very best body. Denise completed her Diploma of Professional Pilates Instruction through the Pilates International Training Centre and has been teaching Pilates for approximately eight years. She is currently studying for her Advanced Diploma and loves the awareness and discovery that develops with increased knowledge. Denise is an ardent lover of the Pilates method as it ‘invigorates the mind and elevates the spirit’ develops strength and gives her the get up and go needed for her active lifestyle with the tools to combat fatigue, help with aging and restore energy levels. Denise appreciates the importance of movement and efficient movement patterns enabling her to participate enthusiastically and with zeal in all activities. She is also a horticulturalist and a lover of all things gardening, a keen traveler and walker and believes we are all a work in progress. Angela is a fully qualified Pilates instructor holding a Diploma of Professional Pilates. She holds membership with both The Pilates Alliance Australasia (PAA) and The Australian Pilates Method Alliance (APMA). Additionally, Angela has certifications in TRX, Pilates for Cancer and Lymphoedema, and is the Redlands longest licensed Buff Bones Instructor. Angela also holds a Certificate IV in Fitness and is current studying the Advanced Diploma of Pilates. Angela was a professional cabaret performer for many years – performing on stage since the age of 4. It was issues with her own health that first introduced Angela to Pilates, and after seeing great personal results, Angela decided to become a Pilates instructor herself, so that she could help other people find the same love and benefits of Pilates that she had already found. Angela’s varied qualifications enable her to give professional advice on Pilates and Cross-training. Angela is consistently striving to enhance her qualifications in order to continue to challenge her mind and body, and pass on her knowledge to challenge the minds and bodies of her clients. When not instructing, Angela likes to help the Redlands Community dance program run for women and people with a disability – Here’s to Life – and also still performs on stage in local concerts and musical productions. Pilates is an exercise system that focuses on stretching, strengthening and conditioning the whole body. Movements are focused on torso, or core, stability to improve posture, balance, body awareness, flexibility and muscle strength. Founder Joseph Pilates explains the practice “develops the body uniformly, corrects wrong posture, restores physical vitality, invigorates the mind and elevates the spirit”. Pilates is unique because of the variety and number of exercises within the system’s repertoire. This allows an instructor to choose specific exercises and modify them to create a program that suits people of all ages and body types. Our Pilates programs are specific to you, as an individual with unique needs, abilities and goals. Find out more about our Pilates sessions here.